Questo programmatore e' compatibile con i Micro AVR e schede AVR-based, Il programmatore emula una STK500 su una porta seriale virtuale ed e' compatibile con il software di programmazione standard AVR. The Pololu USB AVR Programmer v2.1 is a compact, low-cost in-system programmer (ISP) for AVR microcontrollers from Atmel (now a part of Microchip). The programmer provides an interface for transferring a compiled AVR program from your computer to the target AVR’s non-volatile memory, allowing it to run the program. It is a good solution for programming AVR-based controllers like our A-Star 328PB Micro and Orangutan robot controllers. It can also be used to update, replace, or remove the bootloader on Arduino boardsand our Arduino-compatible A-Star controllers. 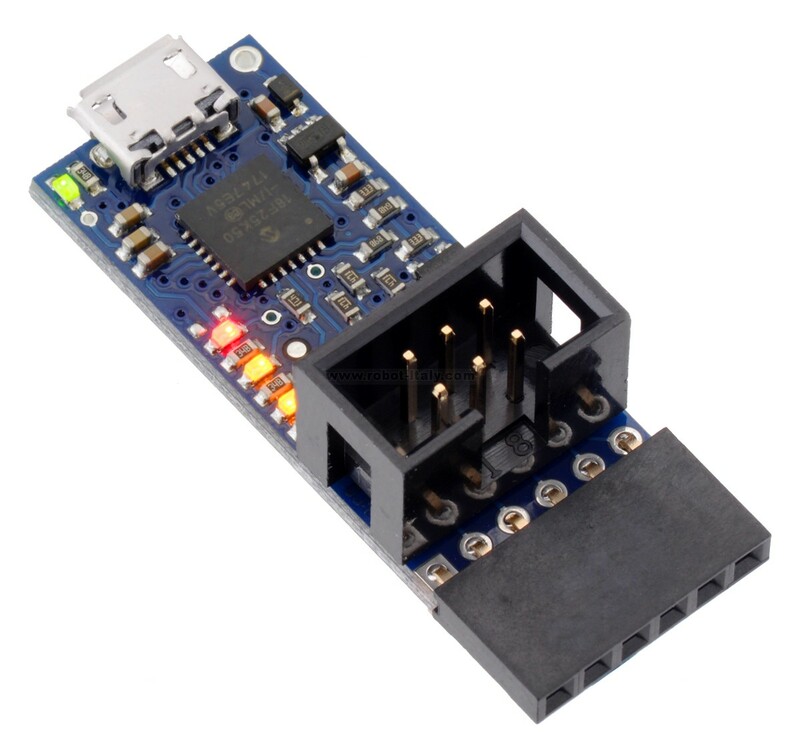 This programmer is designed to work well with both 3.3 V and 5 V devices, and it can even be configured to provide power to the target device in low-power systems. 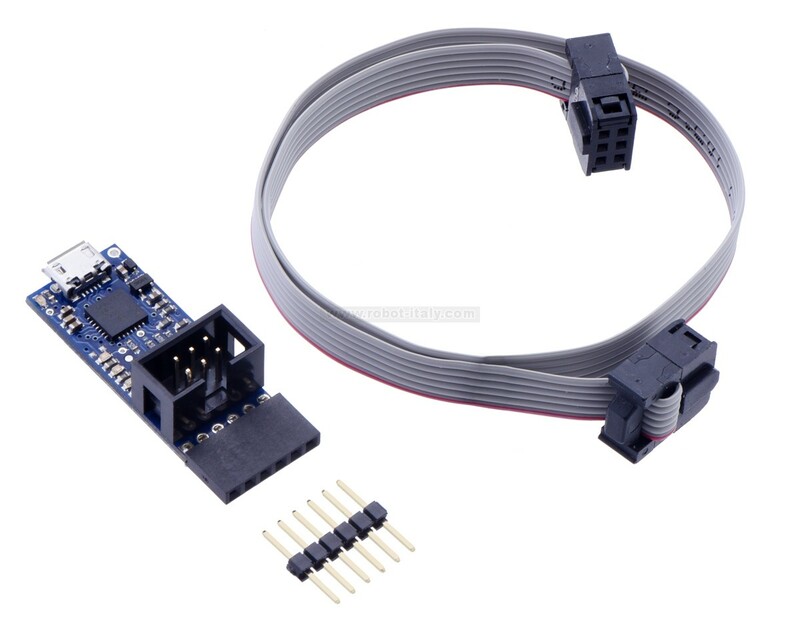 The programmer connects to your computer’s USB port via a standard USB A to Micro-B cable (not included) and communicates with your programming software, such as Atmel Studio, AVRDUDE, or the Arduino IDE, through a virtual COM port using the STK500 protocol. The programmer connects to your target device via an included 6-pin ISP programming cable (the older, 10-pin ISP connections are not directly supported, but it’s easy to create or purchase a 6-pin-to-10-pin ISP adapter). The programmer also acts as a USB-to-TTL serial adapter, providing a TTL-level serial port that can be used to communicate with other serial devices from your computer. It ships fully assembled with connectors soldered in as shown. The programmer should work with all AVRs that can be programmed with the AVR ISP (in-system programming) interface, which is also known as in-circuit serial programming (ICSP), serial programming, or serial downloading, but it has not been tested with all devices. We expect it to work with most AVRs in the megaAVR (ATmega) family, and it works with some members of the tinyAVR (ATtiny) family, but it does not support the Tiny Programming Interface (TPI), and it does not work with the XMEGA family or with 32-bit AVRs. The programmer features upgradable firmware, allowing updates for future devices. The programmer is designed for use with AVR microcontrollers running at either 3.3 V or 5 V. By default, the programmer expects the target to be self-powered, but it can be configured to deliver power to the target device in low-power systems. We support using the Pololu USB AVR Programmer v2.1 and its configuration software on desktop versions of Windows (7, 8, and 10), Linux, and Mac OS X 10.11 or later. Older versions of Windows are not supported. This programmer doubles as a USB-to-serial adapter. The programmer installs as twovirtual COM ports: one for communicating with programming software and one for general-purpose serial communications. This means that you can seamlessly switch between programming an AVR and debugging it through the TTL serial port without having to open and close your terminal program. In addition to the serial transmit (TX) and receive (RX) lines, the programmer lets you use A and B as serial handshaking lines that can be configured using our software. The six pins on the serial header (GND, A, VCC, TX, RX, and B) are arranged to be similar to the pinout of commonly-available FTDI USB-to-serial cables and breakout boards. In the default configuration, pin B is used as the DTR output (and pin A is an unused input), which allows you to plug the programmer directly into a variety of Arduino-compatible boards (including our A-Star 328PB Micro) and use it to upload programs to the board via a serial bootloader. 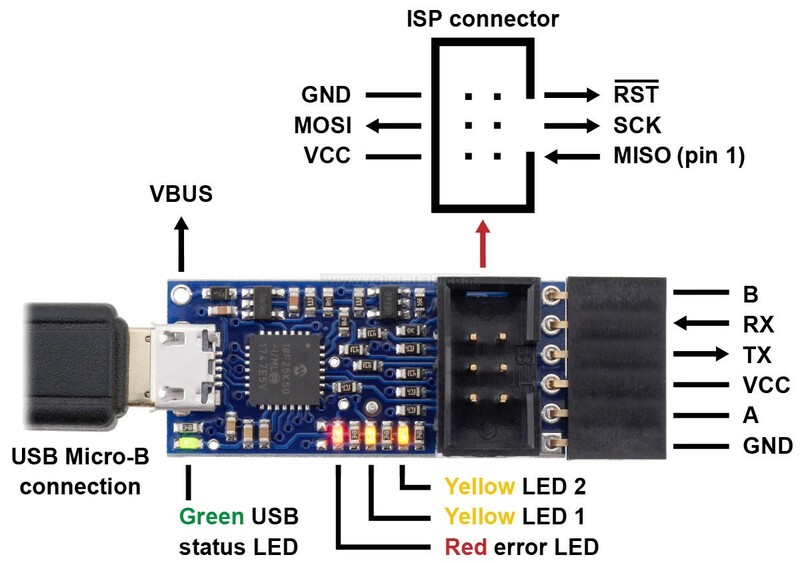 The Pololu USB AVR Programmer v2.1 ships fully assembled with ISP and serial connectors soldered in, and it includes the accessories shown in the picture below. The 6-pin ISP cable can be used to program AVRs. The 1×6 double-sided male header can be plugged into the serial header to effectively reverse its gender (making it possible to connect that header to a breadboard or female jumper wires).